King of the Mountain was designed for large group getaways in Pigeon Forge, TN. This enormous cabin is ideal for family reunions, church groups, weddings, corporate retreats, or any other type of get-together with lots of people. King of the Mountain offers plenty of parking and easy access for buses or church vans. Main Entry Level: Sleeps 8 people in 2 King bedrooms, each with their own bathroom and futon. One bathroom is handicap accessible. Lower Level: Sleeps 20 people in 5 King bedrooms, each with their own bathroom and futon. First Upper Level: Sleeps 48 people in 9 bedrooms consisting of 7 rooms with a King bed and futon, 1 room with three sets of Queen bunks, and 1 room with two sets of Queen bunks. Each bedroom also has a private bathroom. Second Upper Level: Sleeps 8 people in 2 King suites, each with their own bathroom and futon. In total, King of the Mountain has 18 bedrooms and 18.5 bathrooms. An awesome in-cabin swimming pool, two in-cabin hot tubs, and access to a seasonal outdoor pool. An incredible theater room with cinema-style seating for 21 people. A pool table, foosball table, big screen cable TVs, and internet access. A deck with stunning mountain views, rocking chairs, and a gas fire pit. The aspiring chef in your group will love King of the Mountain’s spacious kitchen area on the cabin’s main floor! With two stoves, two dishwashers, two sinks, a commercial food warmer, a full refrigerator, and a full freezer, you’ll have everything you need to whip up a tasty meal. 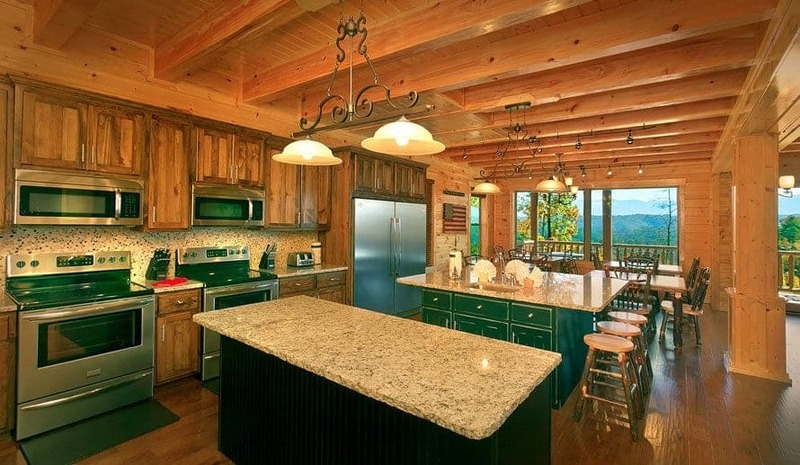 King of the Mountain also has a second fully equipped kitchen on the lower level and an outdoor charcoal grill. King of the Mountain boasts a superb location near the Dollywood theme park and all of the wonderful attractions, restaurants, and shops in the heart of Pigeon Forge. Guests at this cabin will also be just a short drive from the Great Smoky Mountains National Park, the most visited national park in the United States. King of the Mountain opens in April of 2017 and is available for booking now. To secure your preferred dates at the biggest cabin in Pigeon Forge, reserve King of the Mountain today!